The University of South Dakota celebrated the inauguration of its 18th president, Sheila K. Gestring, in Aalfs Auditorium Wednesday afternoon. 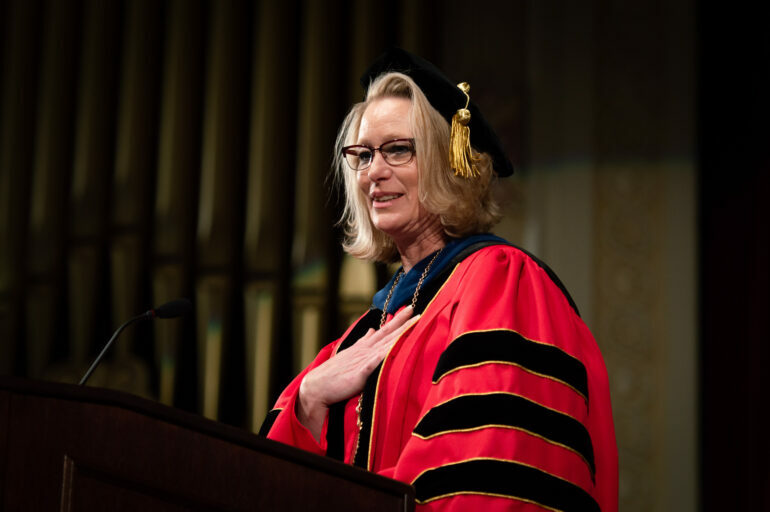 In her inaugural address, Gestring spoke of the first students of USD, the Discovery District in Sioux Falls and the importance of Liberal Arts education. The ceremony began with performances from the USD Symphonic Band, the National Anthem sung by the Vermillion Children’s Choir, and a welcome from Pastor Steve Miller of Vermillion United Church of Christ. A slew of figures from the South Dakota congressional community offered congratulatory letters, including from Gov. Kristi Noem, South Dakota Senators John Thune and Mike Rounds, Rep. Dusty Johnson and State Senator Art Rusch. Sen. Thune chronicled Gestring’s familiarity with the area and its traditions with a description of her upbringing on her family farm west of Vermillion near Springfield. “I know President Gestring will be an amazing and historic leader for the University of South Dakota and I look forward to working with her in the years to come,” Thune’s letter finished. Presidents from surrounding universities also gave congratulatory speeches, including Thomas Shortbull of Oglala Lakota College, Stephanie Herseth Sandlin of Augustana University and Jose-Marie Griffiths of Dakota State University. Griffiths applauded Gestring’s external vision and internal knowledge of a university’s function using an allusion to the perspectives of Earth, viewed both far away from a Satellite and up close from its core. “I’ve often said commencement is my favorite day of the year, and though it’s not graduation day, we are here to celebrate commencement, a new beginning,” Abbott said. After the ceremony, Abbott said he caught a few flashbacks of his inauguration ceremony in 1997, almost 21 years ago. However, he said he doesn’t spend much time thinking about the past. “I just am so happy for Sheila and I think she’ll do a great job for the university,” he said. Nate Welch, President and CEO of the Vermillion Chamber and Development Corporation, said the City of Vermillion will soon offer the new President a gift that is only one in 365. Following the ceremony, Welch said Gestring’s inauguration offered a moment to remember the prominence of the presidential position.